The Ontario Conference of Seventh-day Adventists is the governing division for Canada’s most populous province. One of the earliest sabbatarian Adventists to travel Canada West was George W. Holt. In the 1840s and 50s George Holt held a prominent place as a travelling preacher. He was “widely known and dearly loved.” In 1850, he visited Canada West making stops at Delaware and Ameliasburgh. In 1851, Joseph Bates and Hiram Edson, hiked the length of Canada West from the St. Lawrence River to Toronto. They sought out fellow Millerites in order to teach them about the Sabbath. In a letter written from Toronto on New Year’s Day, 1852, Bates describes their journey through knee deep snow. They made stops at Mariposa, Skewgog Lakes and Reach. Over twenty people decided to observe the Seventh-day Sabbath. In 1890, the Ontario Conference organized. Delegates to the 33rd constituency meeting of the Ontario Conference of Seventh-day Adventists overwhelmingly re-elected Mansfield Edwards (centre) as conference president. 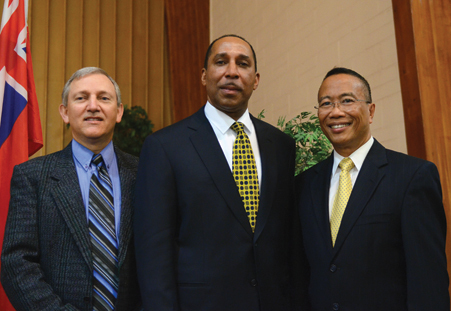 Gary Hodder (left), lead pastor at College Park, was elected as executive secretary, and Ulysses Guarin (right) was re-elected as treasurer for a fourth successive term. In Ontario, as of 2012, there are 30,642 Seventh-day Adventists and 124 churches. The large majority of churches represent members from the Carribbean (38) with other ethnicities represented. 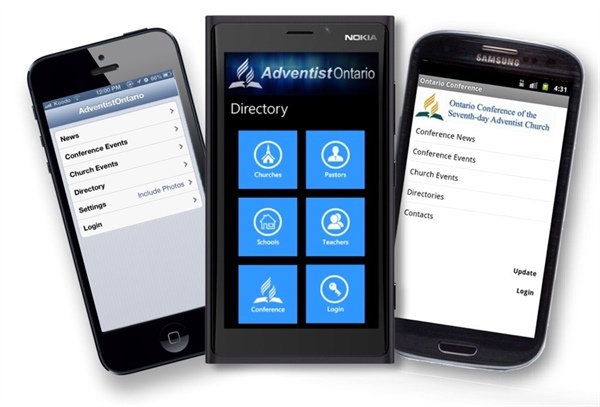 The Ontario Conference of Seventh-day Adventists is pleased to announce the launch of the Adventist Ontario mobile app for Android, Windows phone, and the iPhone. The apps allow easy access to news and events. A directory of schools, churches, and listings of pastors and teachers are also at your fingertips. Kanisa Fellowship was formed as a company within the Ontario Conference in 2003. The church was officially established in 2005 by then president, Derrick Nichols. The first pastor of Kanisa Fellowship was Pastor John Scott. The current pastor is Pastor Mathew Feeley.